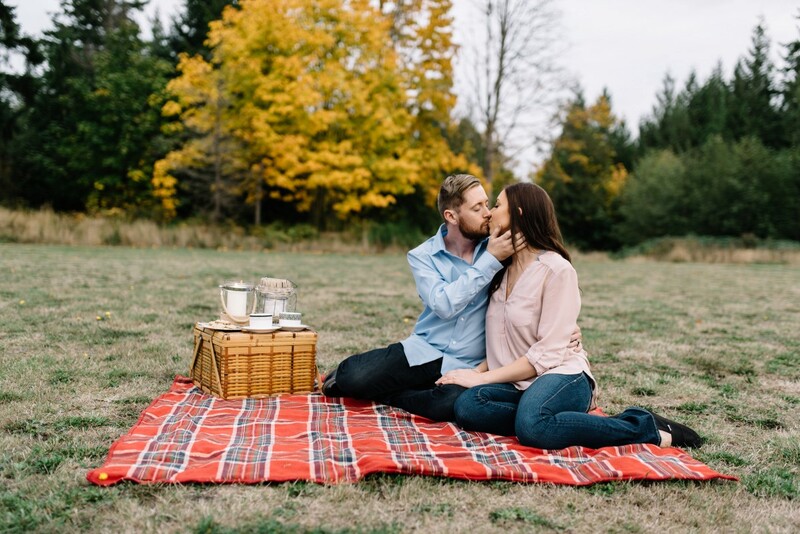 Veronica and Quinten had such fun with their tea for two photo session celebrating their engagement and upcoming west coast wedding. Engagement sessions are fast becoming the best part of getting comfortable with your wedding photographer. Couples are keeping it relaxed, thought much more creative, and taking photos in places important to them. Highlighting hobbies, special moments and shared passions makes these sessions so personal and intimate. Couples are keeping it relaxed while being much more creative! Don’t forget to pull together your fashion – it doesn’t have to be fancy but it can be if you want! Blankets, your special t-shirts, formal gowns…it’s whatever works for you, your partner and the story you are telling. It will also depend to some degree on your location choices and time of year. Although, if you want to swim in the ocean in January no one can technically stop you! Some couples have even had beautiful floral arrangements created for the occasion or hired a planner to provide décor and direction. So we loved Veronica and Quinten’s engagement story because they did it all! They both love drinking tea so the ‘tea for two’ picnic was perfect. It also led to some great blanket shots amongst the forest trees. The ocean side showcased Quinten’s love of photography and sketching while Veronica channeled her inner goddess which was perfect for the lovely floral bouquet. We especially loved the great smiles on these two! The gorgeous sunset in the background is a real highlight as well. Be sure to have a chat with your photographer before and let them know if you are hoping for sunset shots. Your photographer will set up the timing and location – don’t expect them to just ‘know’! It is a great idea to send a Pinterest Board of ‘shot ideas’ that you would like to have in your session. The naturally beautiful west coast engagement session of Steph & Jamie will give you even more great Vancouver Island location ideas!